The kitchen isn’t just for cooking up a storm­—this gathering place deserves to be as stylish as the rest of your home. No longer solely a functional room in which to prepare food, the kitchen is now used for dining as well as a stage for entertaining. Here, we list the trends to watch and the myriad ways to craft a chic and functional culinary space. Sydney-based interior designer Greg Natale says coloured cabinetry is becoming a hot trend, with inky blues and sage greens as top choices. “They bring a new depth and vividness to kitchen designs,” he says. Look to these chic shelving options from Montana. As seen here, a moveable kitchen island can be an adaptable addition to your dry kitchen; wheel it aside when you need more space, or use it as a gathering centre for drinks with your guests. For finishes, a hot trend at the moment is the use of subtle textural differences that give depth in order to break up the monotonous nature of surfaces, according to Daniele Brutto of London-based Hub Kitchens. “There’s a move towards using natural, exotic stones in contemporary kitchen designs,” she says. 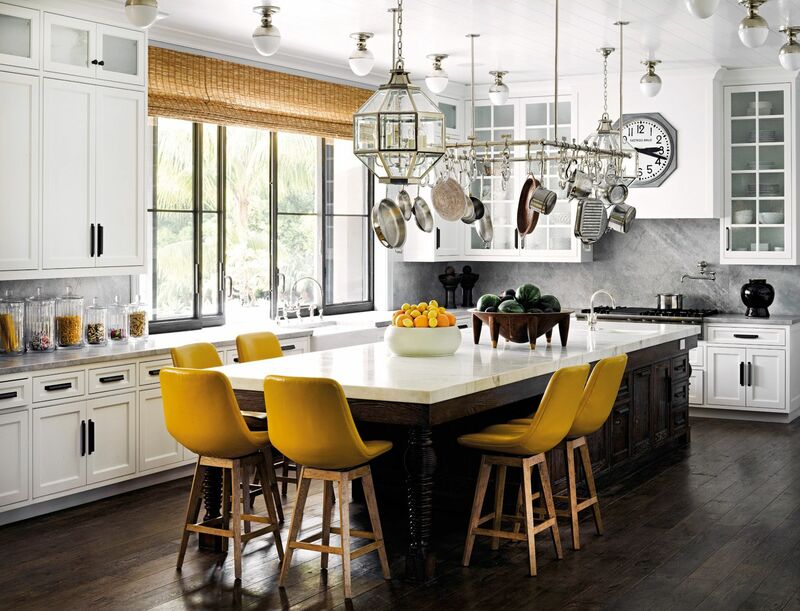 “We are now starting to experiment with this natural look on stark, clean modern cabinetry—with amazing results.” As seen above, this kitchen by Martyn Bullard Lawrance Design pairs myriad textures beautifully, with accents of yellow on the dining seats for family and guests. Frank Leung of Via Architecture in Hong Kong says that little can beat natural materials such as stone, or ceramic contrasting with metal and timber, for understated elegance in a kitchen. “We’re seeing a lot of cool stone surfaces matched with warm timber or glass with copper accents, such as the Miele ArtLine in Graphite Grey and my favourite, Vincent Van Duysen for Dada (as seen above),” he says. The kitchen island creates a culinary zone, while staying within close proximity of the dining and entertainment area. Ed Ong of Singapore’s The Kitchen Society emphasises the need for creating a kitchen that is not just functional but one you enjoy using: “If you are an avid cook, the kitchen should be designed and organised to serve you well.” For instance, open shelves keep recipe books within easy reach (that guests could browse too! ), while decorating your kitchen space. The perfect kitchen worktop, Laminam’s supreme lightness, toughness and pristinely flat surface make it a must for your next kitchen renovation. Easy to clean, the slabs are also resistant to mould, mildew, heat and scratches, retaining the ceramic’s integrity and colour for years to come. A thoughtfully curated wine collection requires equally thoughtful storage. The Noir Series, which features a sleek design, assistive light, electronic temperature controls and adjustable shelves, offers oenophiles a safe and stylish home for their vintages; these can also be integrated into your kitchen island and cabinetry.